Do I need to add a controller to my LED light in order to change between colors and light shows? Instead of a led pool light controller, a homeowner can use a simple light switch to toggle between solid colors and light shows. To give you an example how this works, let’s say that you turn the light on, and it’s set on blue, to change the color you just need to flip the light switch off and back on. You would continue this to cycle through the colors to reach the desired setting. The downside is if you accidentally pass the color you want you will have to cycle all the way back through. 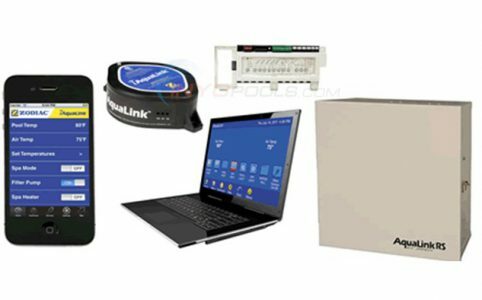 If you want to get a little more interesting then an automated controller or dedicated led pool light controller is still an option; something like the Hayward Prologic, Jandy Aqualink, or the Pentair EasyTouch. The aforementioned pool controls have wall mounted or handheld remote options. 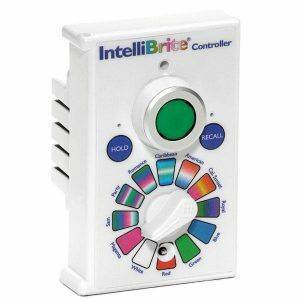 Pentair offers a controller that works exclusively with their Intellibrite LED Light, and it is aptly named the Intellibrite Controller. The dial face resembles a dimmer switch allowing you to switch between solid colors and light shows with ease. Thank you for joining us. If you have any other questions please leave a comment down below. It’s been great. Bye. Will intellibrite work with the prologic ? The ProLogic would only control the on/off function of the IntelliBrite. The ProLogic would not be able to change speeds. Will the intellibrite light work with Jandy PDA -6, such as changing color, speed..? I have already setup the remote for pool lights and spa light on PDA. I am thinking of change all 3 Jandy lights to pentair LED intellibrite. After I read some articles on the Internet, I have concerns about the compatibility between Jandy PDA and pentair LED lights. Thank you for your help. I would like to change from incandescent to LED. I currently have a dimmer in the circuit. Will LED lights work with an incandescent dimmer, or will I need to switch out the dimmer for a standard switch? The lights I researched (PureColors, IntelliBrite, and ColorLogic) either said specifcally NOT to use on a dimmer switch or said they were not dimmable. If you make the move to an LED, install a standard switch.